TELUS has a service called Pik TV, a media box that “connects you to the world of Android TV.” Customers will be able to access live TV and on demand channels, while also access Netflix and YouTube, from your home or away on mobile via the Pik TV iOS and Android app. 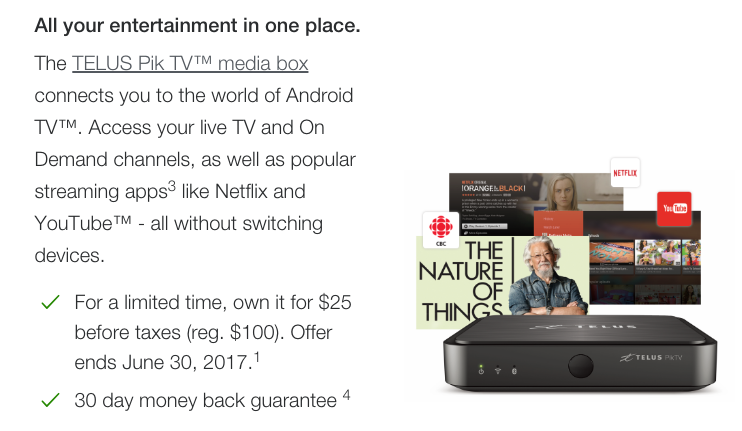 Normally priced at $100, TELUS has discounted the media box by 75% off to $25. The offer ends on June 30, 2017 and comes with a 30 day money back guarantee. Also, the first month of Pik TV is free. The goal with this service is to combine live TV, streaming apps and Telus Internet starting at $75 per month, without contracts. Must qualify for TELUS Internet 25 if you’re new to TELUS Internet, live in BC or Alberta, and not currently be subscribed to Optik TV. Users will be able to add or remove channels via My Account, but only once every 30 days. Pik TV does not require any contracts and also doesn’t use your Internet data bucket and is limited to one Pik subscription per household. 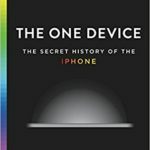 Any TELUS Pik TV subscribers out there?